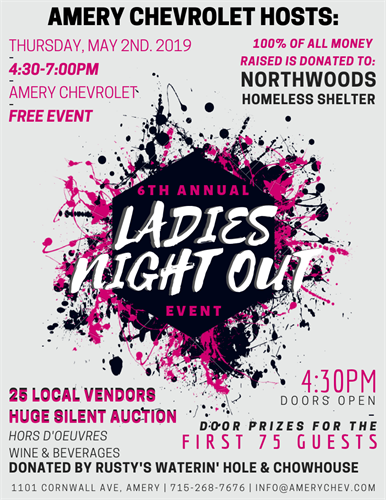 6th Annual Ladies Night Out Fundraiser Event! Please join Amery Chevrolet as we host our 6th Annual Ladies Night Out Event! This FREE fundraiser event will have 25 vendors, a HUGE silent auction, hors d'oeuvres wine & beverages donated by Rusty's Waterin' Hole. 100% off all money raised is donated to Northwoods Homeless Shelter.